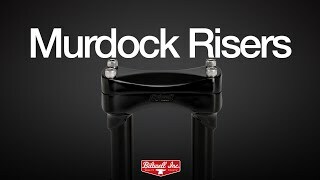 Overview: Murdock risers feature investment-cast steel top clamps and lower threaded bases, and are connected by two 1-inch O.D. x 0.120” (3mm) wall seamless 4130 chromoly tubes. After TIG welding the finished unit is hand polished and triple chrome or satin black plated for style and durability. The threaded bases on Murdock risers are on 3.5” (89mm) centers to fit most stock and aftermarket H-D triple trees with removable bar clamps. Of course, the bolt pattern on the Biltwell Murdock riser’s one-piece handlebar clamp fits stock H-D speedo and tach brackets. 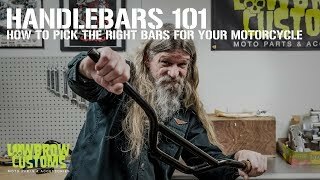 1/2-13 threaded holes on mounting bases accept stock H-D hardware.